Horner Painting is proud to serve our neighbors here in Windsor with premier home painting services, including both interior and exterior services. We take pride in providing a litany of services that will make your home look pristine on the inside, and picturesque on the outside. With every job, we employ a process that works, and at the end of every job, we’ll provide a complete walkthrough inspection, so that we know you’re entirely satisfied with our work — after all, that’s our main goal: to make sure that our customers are completely satisfied with the project. As we mentioned, we provide a suite of services, including interior painting, exterior painting, and more. Read on to learn more about our individual services and find out why Horner Painting is the trusted, local painting company here in Windsor. If your home has walls that are caked in archaic wallpaper, walls that haven’t been painted since the seventies, or walls that are beaten up, discolored, and smothered with smudge marks, we can completely revitalize the look of your home with our interior painting services. Here’s a bit more about the benefits of our interior painting services, our painting process, and why you should count on Horner Painting for your upcoming paint job. If you’re on the fence about painting the interior of your home, we’re here to convince you that now is the right time. Giving your home a fresh coat of paint gives it a modern look, bringing your abode into the 21st century. Plus, you can get creative with the colors that you choose for your home. Give your home a personalized touch with bold, new accent colors — you might opt for rich colors to transform your home into a warm, creative space… Or, you may opt for quiet earth tones to give your home a calm, comforting appeal. The options are endless. Painting your home’s interior also adds value to your home, which can pay off should you choose to place your home on the market in the near future. If you have any walls that are an eyesore (including walls with chipped paint, discolored walls, walls with smears, handprints, or crayon marks, etc. ), then painting your walls is a must in order to attract potential homebuyers. In short, a new coat can modernize your home, add value to your property, make your home more comfortable, and it can fix those ugly problems around the surfaces of your home. First thing’s first, we start with your vision. We’ll work with you to determine your vision for your walls and spaces. We provide color consultations for those who are undecided about their paint selections. Once you’ve settled on your paints, and the surfaces upon which you’d like to paint, we’ll get started. We begin by moving and protecting your furniture — we’ll have you move smaller items before we get to your home, to protect your belongings and to make the process quicker. Then, we’ll throw down drop cloths and we’ll plastic wrap any furniture or objects that can’t be moved during the painting process. Once everything is adequately protected, we’ll begin repairing your surfaces, if there are any surfaces that require repairs (e.g. surfaces with cracked paint, walls with holes, etc.). Afterwards, we’ll tape off the corners, lines, and details on your surfaces. And finally, it’s time to paint. For larger, multi-day projects, we’ll work from room to room so that you can still navigate through your home when we aren’t on site. Once your painting job is completed, we’ll move furniture back, clean up, and then we’ll perform a final walkthrough with you to ensure that you are completely satisfied with our work. If you aren’t satisfied, we’ll do our utmost to make it right. Horner painting has proudly been serving the Windsor community since 1999. 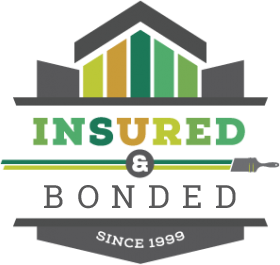 We’re insured and bonded, we follow a simple, efficient process, and we offer a comprehensive warranty on our work. All of our work is covered by a full five years of coverage. The policy is simple: If you have a problem, we’ll fix it — no questions, no exclusions. The warranty is included in the painting cost. If you’re ready to beautify the interior of your home, just reach out to us, or get a free estimate. The exterior of your home provides its first impression — and a freshly painted home is far more appealing than an outdated, discolored house. Improve the look of your home while adding a protective layer with our exterior painting services. We use paint that is specifically designed for your exterior — paint that won’t weather easily, even in the face of sun and precipitation. Let’s take a detailed look at the benefits of our exterior painting services, our painting process, and why Windsor residents trust the crew here at Horner for their exterior painting needs. Painting your home’s exterior provides a personal touch that will make your home feel just that: like it’s yours. Plus, a fresh coat of paint will modernize the look of your home. If you’re planning on selling your home at any point in the future, a paint job will boost the price tag of your abode, while providing curb appeal that can bring in a buyer. When we paint houses, we also make any necessary repairs to the home’s surface, so that your home looks whole once again. With Horner Painting, you’ll have a home that feels more homely and more modern, and a home that holds more value and curb appeal. To kick things off, we’ll work with you to determine the perfect colors for your home and its trim. We provide color consultations for homeowners who are having a bit of a struggle selecting colors. Once you’ve decided on the perfect paints for your home, we’ll get to work. If you have any exterior walls that require repairs, we’ll start there — we provide minor siding repairs and replacements. Next, we place drop cloths and protective plastic to cover plants, edges, and landscaping around your home — we don’t want to make a mess as we work around your abode’s surfaces. From there, it’s time to paint. We’ll thoroughly coat every wall and every stick of trim around your home. Finally, it’s time for a walkthrough. We’ll walk around your home alongside you to ensure that you are completely satisfied with our final product. If anything looks less than perfect, we’ll fix it. That’s just our policy. If you’re a resident of Windsor and you’re looking for the best crew to paint your home’s exterior, you needn’t look any further than Horner Painting. We have nearly two decades of experience serving folks throughout Windsor with our painting services. Our team is highly professional, and we’re insured and bonded, so you can rest assure that if a mistake should happen on your property, you won’t be on the hook. We strive to provide pristine paint jobs, through efficient, effective processes. 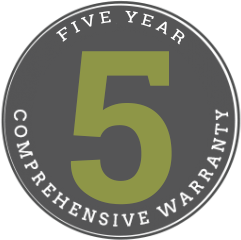 It’s our goal to leave you completely satisfied with our work — which is why we provide a comprehensive five-year warranty on all of our craftsmanship. Our policy is simple: If you have a problem, we fix it. No questions. No exclusions. Take note, our warranty is included in the cost of your painting project, so you won’t have to pay a dime above our affordable painting prices. Ready to give your home’s exterior and update? Just reach out to us, or get a free estimate. On top of our traditional painting services, we provide color matching services. Often, folks find themselves in a bit of a pickle — they’d like to keep the paint color of their home, but they need to paint additional surfaces or paint repaired surfaces, and they’re out of the original paint (or the original paint dried up in that open bucket long ago). When you find that you’re stuck without the right paint color, don’t fret. We provide precise color matching services to ensure that your walls look contiguous. We find that folks come to us for color matching services for a couple reasons. First of all, they may have a wall that requires repairs. If, for instance, you decided to try out chipping golf balls with your new 9-iron on off of the living room shag carpet, and instead of lightly popping a ball over the couch, you sent it sailing into the drywall, you’ll need a repair. Once your wall is patched, you’re going to want to paint match that new patch. And if you’re out of matching paint, we can help. Other times, homeowners approach us if they want to extend the use of a specific color in their homes. For example, if you want to add a few more accent walls in the avocado green color that you love so much, you may need to have us color match your paint if you ran out of that avacado green on your last painting project. You may also need to color match your paint if you are removing fixtures around your home. Often, fixtures (e.g. thermostats, light switches, towel hangers, etc.) are built into a home prior to painting. When these fixtures are removed, you’re left with an unsightly unpainted surface. Again, we can help you out with a color match. Color matching is a relatively straightforward process. First, we’ll take a sample of the color as it is painted on your wall — usually, we’ll just pull off a small chip of paint. Then, we take that paint sample, and analyze the color with a specified machine. This machine provides a paint dye mixture, which is then created and mixed. And voila, you have a bucket of paint that matches your current color. We know how much precision counts when it comes to color matching. We do our utmost to ensure that your color-matched paint does just that: It perfectly matches the current paint color in your home. You shouldn’t be able to notice a different shade or hue on your surfaces, even close up. 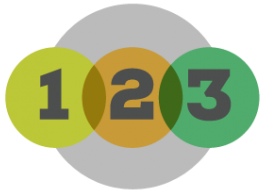 If you’re further curious about our color matching services, just reach out to us! When you’ve had a kiddo crash into the drywall of your home, we’re here for repairs. 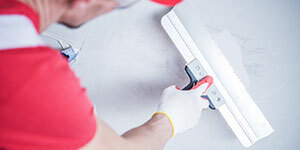 We can repair most drywall issues, so long as they can be patched by our painters. Then, of course, we’ll repaint the surface, so it looks as though nothing had ever happened. 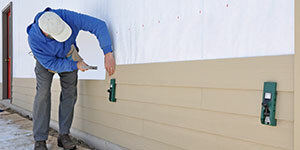 If you have siding that has suffered the wrath of Mother Nature, we can repair it. 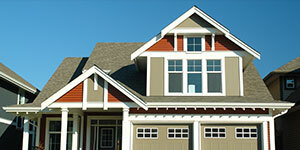 We repair and replace various siding panels that are cracked, dinged, out of place, or missing entirely. Once your home is whole again, we’ll apply a fresh coat of paint. 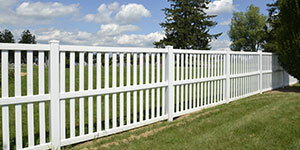 While we’re on the property, you can count on our crew for fence and railing painting as well! We don’t just paint home exteriors. We also tend to the other components of your property that wrap around and weave through your landscape. Caulking and glazing are essential to ensure that your windows and doors are airtight and waterproof. Unfortunately, caulking and glazing doesn’t last forever. 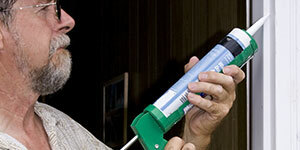 Fortunately, we’re here to help when your caulk or glaze wear out. That’s right. 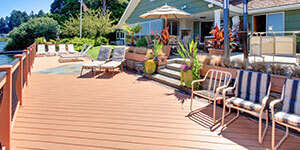 We can paint your deck, deck railings, and patio covers too. So if you want to give your entire home a facelift, you only have to make one call. 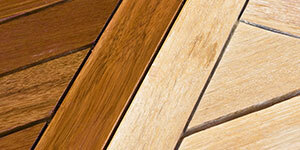 Horner Painting coats and paints wood surfaces, as well as home exterior surfaces. If you have any wood structures on your property, we can give them a better look and more longevity with a fresh layer of varnish or clear coat. Again, you can combine our varnish and clear coat work with exterior painting for a full property makeover. Driveways, deck, siding — we can power wash the surfaces around your home. We often power wash surfaces if we’re applying a coat of paint or varnish, to ensure that that coat adheres properly. We can also power wash the rest of your property while we’re on site. 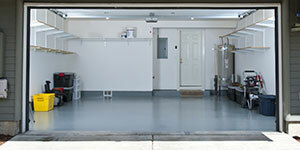 We don’t just paint homes, we can also give your garage an upgrade. What about sheds? We do that too. Oh, and that unfinished basement? We’re here when you’re ready to finish it. If you just need to paint the trim of your home, we can do that as well. We understand how powerful this accent can be for the overall look of your home. We’ll paint your trimming accordingly. Here at Horner Painting, our number one priority is your satisfaction. That’s why we provide thorough, yet efficient painting services that are affordable for homeowners. That’s also why we back our work with a five-year, comprehensive warranty — you can rest assured that your home will look great for decades. If you’re ready to experience the Horner Painting difference for yourself, get started with a free estimate, or reach out to us if you have any questions.